‘Star Trek’ star William Shatner poses with a 2-D image of Canadian astronaut Chris Hadfield as part of a photo contest run by the Canadian Space Agency to promote the spaceflyer’s upcoming mission. Famed actor William Shatner, renowned for his iconic role as the fictional captain of the Starship Enterprise on TV's "Star Trek," is about to call up a real-life space man. The James T. Kirk actor will call the soon-to-be commander of the International Space Station on Thursday (Feb. 7). Shatner, who is Canadian, will speak with fellow Canadian astronaut Chris Hadfield via video and phone in a social media gathering sponsored by the Canadian Space Agency. Shatner and Hadfield, who have already traded messages via the Internet, will have their conversation live in front of audience members, who will have the chance to ask questions of Hadfield using the space-to-ground video link. This will not be the first time the "Star Trek" captain and the real-life space flyer have beamed messages back and forth. On Jan. 3, Shatner sent Hadfield a note via Twitter to ask what life is like aboard the spac station. Hadfield responded in kind. "@WilliamShatner Yes, Standard Orbit, Captain. And we're detecting signs of life on the surface," Hadfield (wrote in his Twitter chat with Shatner. Hadfield regularly posts messages and photos of his mission as @Cmdr_Hadfield. Even before Twitter brought them together, Hadfield was on Shatner's radar screen. 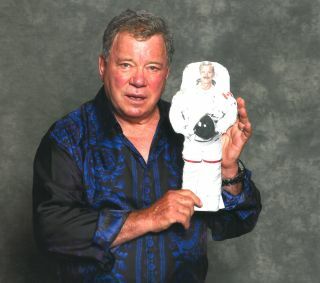 Shatner posed with a small photo cutout of the astronaut as part of the public outreach program for Hadfield's mission. Hadfield and two crewmates — American astronaut Tom Marshburn and Russian cosmonaut Roman Romanenko — arrived at the space station in December aboard a Russian Soyuz spacecraft. They joined three other crewmates already living aboard the space station. Hadfield is the flight engineer for the six-man Expedition 34 crew, and will take charge of Expedition 35 in March, when he will become Canada's first space commander. Since NASA astronaut Mike Massimino became the first spaceflyer to use Twitter in 2009, astronauts aboard the International Space Station have used the social media service as a way to post mission updates and photos. Hadfield also used the website to release the first original song ever recorded in space (his tune "Jewel in the Night" has 88,927 views on YouTube as of today). Visit SPACE.com on Thursday, Feb. 7, to watch Star Trek actor William Shatner call astronaut Chris Hadfield live at 10:40 a.m. EST (1540 GMT). You can watch the Shatner-Hadfield space call live here on SPACE.com.